Use your Visa Canada Reward Card anywhere Visa debit cards are accepted around the world. Your card is pre-loaded with value and can be used just about anywhere Visa debit cards are accepted worldwide.Visit the website listed on the back of the card for additional instructions, fees and Cardholder Agreement. 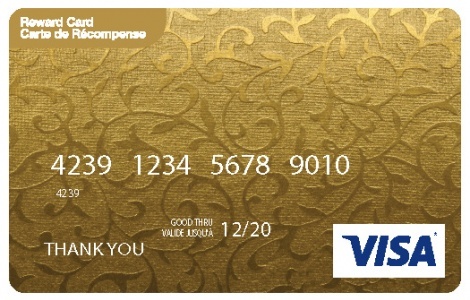 The Visa Canada Reward Card is issued by Peoples Trust Company pursuant to a license from Visa Inc. Pay close attention to the expiration date printed on the front of the card. Card is valid through the last day of the month. You will not have access to the funds after expiration. Order bulk Visa Canada Reward Cards form NGC Canada today! Card is issued by Peoples Trust Company pursuant to a license from Visa Inc.